An American friend was expected to arrive in two weeks in Delhi. She had planned on celebrating her 52nd birthday with me and then go to Srinagar. Since she was particularly taken with ‘Bidriware’ — the ancient art of silver inlay on an alloy of metals, cast into various shapes —I spent hours looking for a small item as a birthday present. But no one seemed to have anything—a box, a bowl or even napkin rings. Finally I did find something I had never seen before—Bidri jewellery! A craft exhibition at Baba Kharak Singh Marg had it. There was an elderly man who had quite a few rather large pieces—tall vases, large jewellery boxes and ashtrays. Seeing the disappointment on my face, he pulled out a cardboard box full of pendants, earrings and bangles. I was overjoyed—I had found the perfect gift for my friend! My connection with Bidriware goes back to when I was visiting Aurangabad, almost 15 years ago. I discovered Abdul Rahim Jaffer in his workshop, bent over his wooden block shaping exquisite silver motifs for inlay. I sat and watched him work and was amazed at his dexterity. After completing the piece he had been working on, Jaffar informed me, that he was the only Bidri master craftsman in the city. Earlier there had been two other workshops in Aurangabad, but these had to close down as the artisans were unable to sell their wares. Abdul added that he and his two sons are determined to continue the craft and have recognised the need to make items that are functional rather than decorative. In addition to the ealier items, they have also begun making items like small plates, pill boxes, buckles and kurta buttons and jewellery that includes earrings, pendants and bangles for women. I remember Abdul proudly showing me an extremely intricate Zodiac Clock, which he hoped would be a money spinner. I remember telling him to make less expensive items like coasters and small bowls that would be more sellable. He thanked me and said that it this sort of guidance that artisans need, as they know very little about the latest trends. The origins of the ancient art of Bidri, has never been clearly documented. However, it is clear that the craft was named after Bidar, the city of its origin. An important city at the time, Bidar was the capital of the Bahmani Kingdom, which now falls within the state of Karnataka. According to Abdul, the Bidri technique was brought into India in the latter part of the 15th century by the Moghuls. It is said that two master crafts men from Iran came to India and were invited by the Bahmani monarch, Mohammad Bahadur Shah, to settle in Bidar. An astute monarch with an eye for aesthetics, Shah had recognised the potential of the craft and gave the Iranians all the help that they needed. Royal patronage helped the craftsmen to create exquisite pieces that became famous all over ‘Hindostan’. In the process two of their assistants also became well-versed in this intricate craft. These two Bidar locals trained by the Iranians, Sajjad Quadri and Ramanna Master are said to have pioneered the craft in India. The workshops set up by them paved the way for many more and in subsequent years, the craft spread to Aurangabad, Hyderabad and even eastward to Purnea in Bihar. 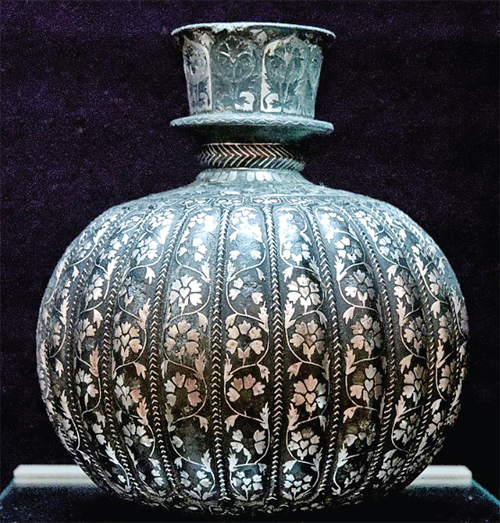 Though the technique of inlaid metal work came from Iran, the craft in its traditional form is now practiced only in India. An alloy of metals, predominantly zinc, is cast into various shapes. The surface of the item is darkened with a coating of copper sulphate and designs are engraved on it. Since the engraved portion is lighter in colour than the rest of the surface, the designs are clearly visible for the inlay work. Traditionally the inlay used to be in silver, but for royal patrons, gold was also frequently used. These days brass is being used quite affectively with silver. After the inlay work is complete, the designs are smoothened with a file and burnished. The final stage is to blacken the surface of the item with a paste of ammonium chloride, sodium chloride, copper sulphate, potassium nitrate and mud. This darkens the surface without any adverse effect on the inlay. The paste is then washed off and oil applied to the surface to give it a sheen. According to Abdul, it is said that the ancient plaster of the Fort of Bidar was the best for creating the distinctive matt black on all bidri items and ever since he can remember, artisans would collect wall scrapings for their trade. This may have been one of the reasons for the damaged walls at the Fort, which is now under ASI with the fort’s conservation well under control and the Fort of Bidar considered one of the best kept heritage structures. On being asked what impelled him to enter this particular trade, Abdul said, “My fascination with Bidri began when I was very young and would run away from school and spend hours watching the deft bidri craftsmen create ‘magical’ huqqa bases and vases.” By the time he was twelve, Abdul already knew all the intricacies of the craft and persuaded his father to allow him to join’ Gulzar Deccan’, the most prestigious Bidri workshop in Bidar. It was there that Abdul’s talent was recognised and very soon he was appointed chief designer. Under his guidance many new designs, shapes and artifacts were created. These were far superior to the products from other factories. Abdul and his sons now have a factory of their own in Aurangabad and are continuing their work.